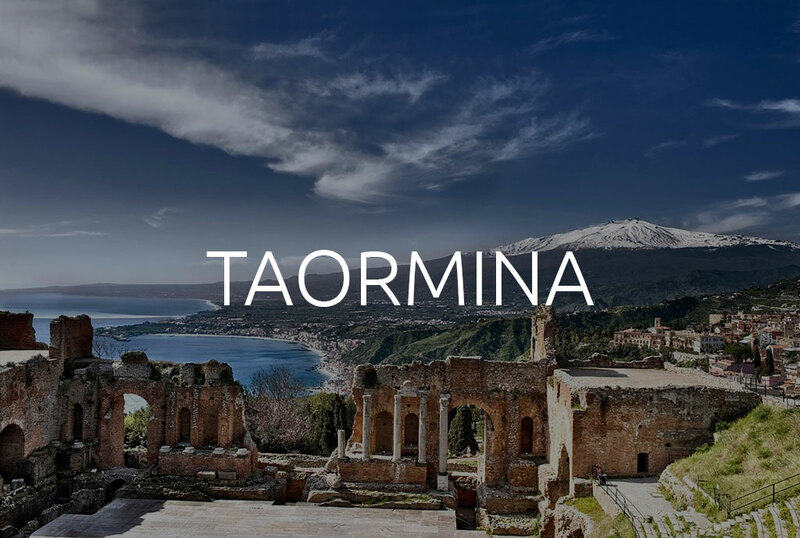 In the 1800s, after the Goethe praised its beauty throughout Europe, mentioning it in his book Italian Journey, Taormina became a mandatory stop on the Grand Tour – the long journey made in continental Europe – by the young European aristocracy of the time to enrich their own culture. Today, it is a tourist capital of Sicily and many travellers enliven its streets throughout the year. 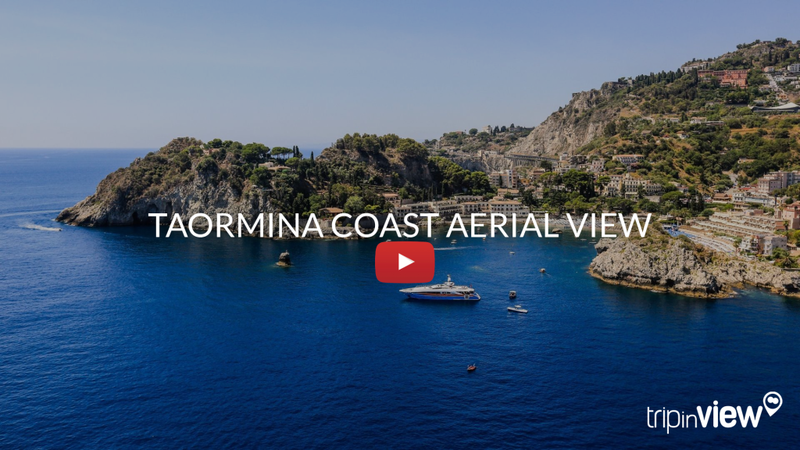 The ancient Greeks loved to construct their buildings in beautiful scenic locations Here they found the pairing of Etna and the bay of Naxos, with a wonderful view that when the air is clear can reach the coast of Calabria. It is, surely, the main monument of the city, not only for its intrinsic artistic value, but also for the scenic location in which it is placed. The view enjoyed from up there is even defined as the view par excellence. 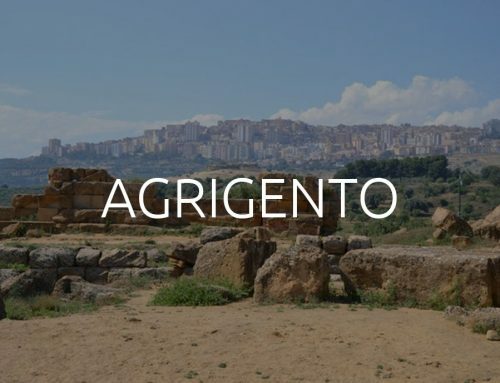 The one that is not to be missed when in Sicily. 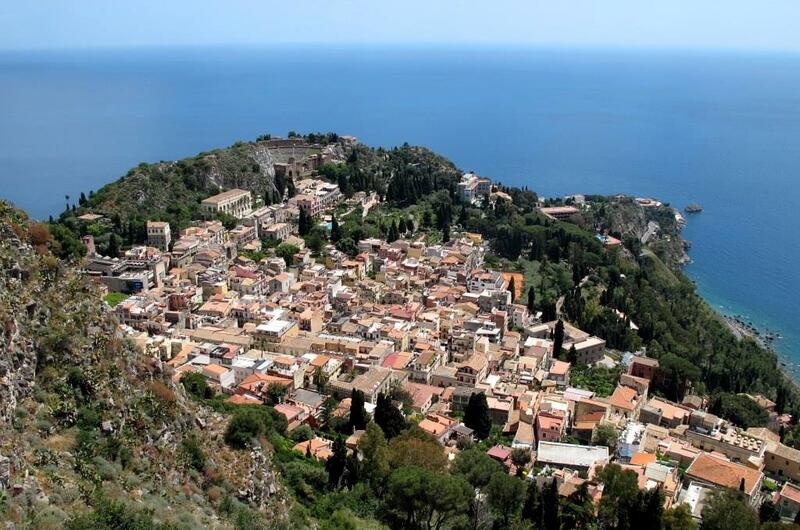 The northern entrance to the city once surrounded by fortifications built by the Arabs leads us to the struscio (stroll) the slow walk along the centre of Taormina..
Small craft shops, antiques shops, small streets, fragrant, multicoloured alleys accompany us along the route. The first important encounter of our walk is with Palazzo Corvaja (Corvaja Palace), in the 1400s home to the Sicilian Parliament with its picturesque internal courtyard and beautiful large mullioned windows on the front. Currently the first floor houses the museum of arts and popular traditions while the ground floor is the tourist information office. 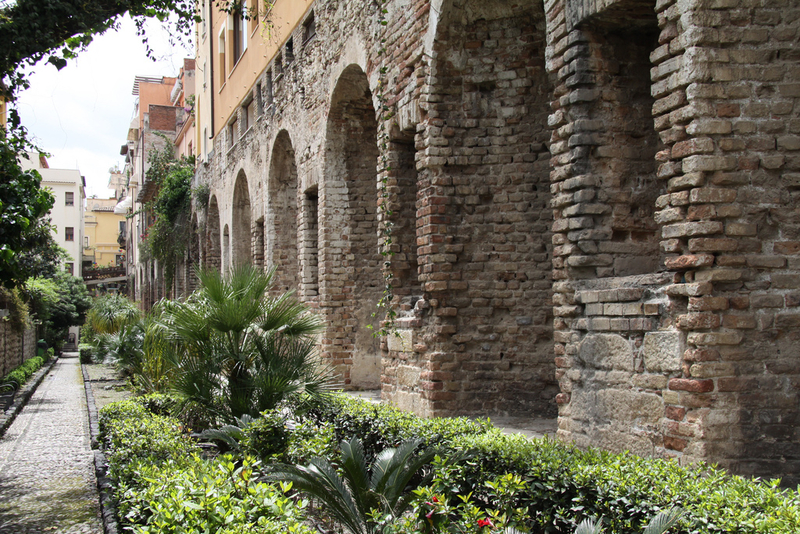 From here the via del Teatro Greco will take you to this impressive monument. A gem is hidden near the Corvaja palace, the Naumachia, which together with the theatre, is the second important testimony of the Roman city and it is also one of the greatest Roman monuments of the island. It is a large terrace that protects a now non-existent tank. The Romans held games here simulating historical battles, hence the name. Continuing along the corso Umberto you arrive at the Piazza del Duomo with its beautiful baroque fountain. The Duomo di San Nicola, was built in the thirteenth century, but it was remodelled in the fifteenth, sixteenth and eighteenth centuries. Its roughly squared and severe appearance is reminiscent of Norman cathedrals. The main portal, surmounted by a small rose window and flanked by two ogival single-lancet windows, was made in 1636 in the Renaissance style; two other portals, from fifteenth and sixteenth centuries, are respectively on the left and right sides (the first one is particularly noteworthy). Inside, there are three naves, some interesting paintings by Antonino Giuffre (1436) and a polyptych by Antonello de Saliba (1504). 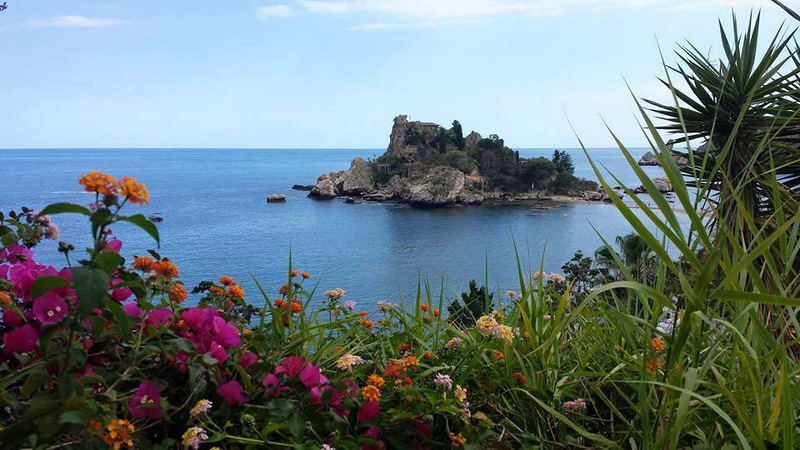 The small island of Isola bella was bought in 1890 by Miss Florence Trevelyan who enhanced it by building a house and cultivating rare precious essence plants. In the 50s it became a residential hotel of the elite and was declared of significant historical and artistic interest in 1984 by the Department of Cultural Heritage. More than an island it is considered an offshoot of the mainland connected by a thin strip of pebbly beach that, in the central section remains submerged. 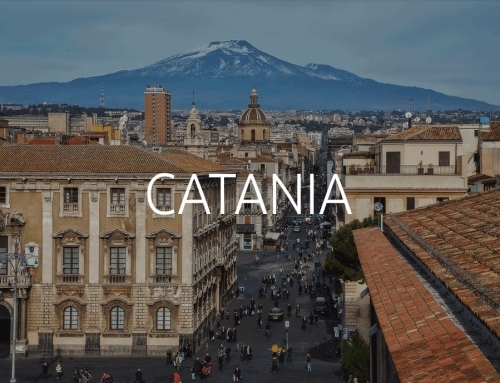 Today it is managed by a centre for environmental protection at the University of Catania. 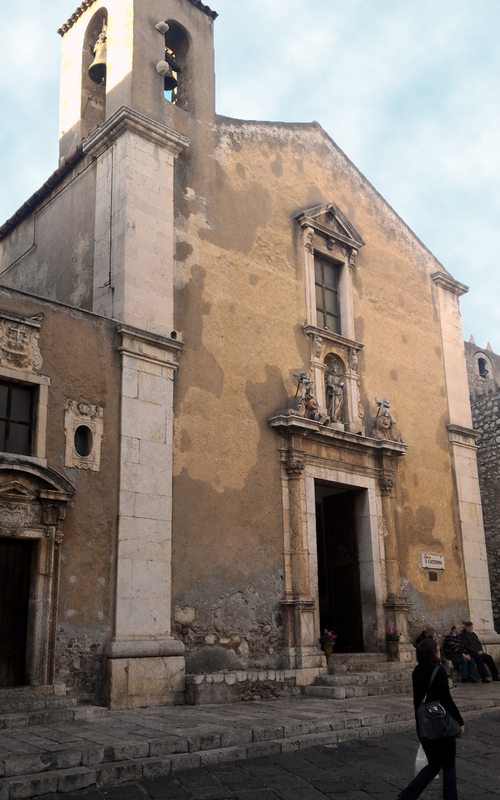 The church of S. Pancrazio, bishop and martyr, patron Saint of Taormina, stands on the ruins of the Greek Temple of Jupiter Serapis . 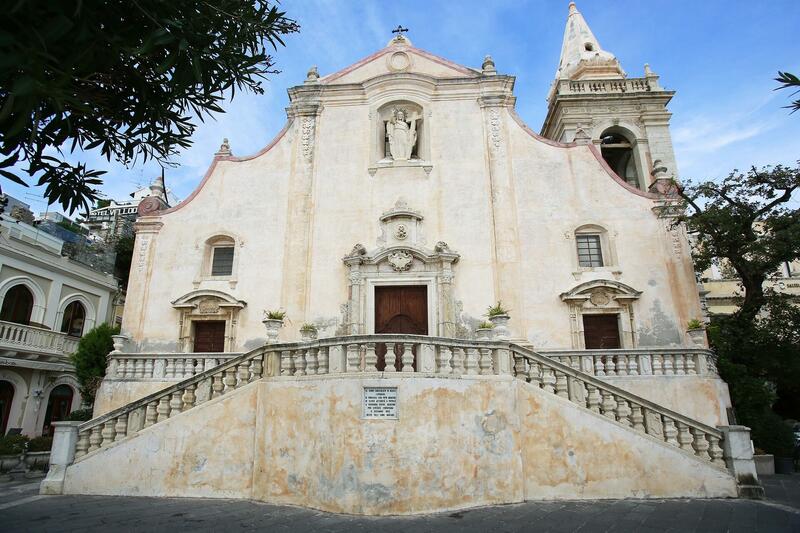 Its baroque architecture goes back to the second half of 1500. Particularly interesting is the main portal with jambs and architraves in Taormina stone; two Ionian columns decorate each side. Inside, above the portal, you can see the gallery with the organ. On the right, the two minor altars with two interesting oil paintings on its top, the first depicting the martyrdom of St. Nicon, and the second the consecration of St. Massimo, successor of St. Pancras.Two additional minor altars are placed on the left wall, a fresco depicting Tofano Cerameo, last Bishop of Taormina, between them. A low, wrought iron railing leads into the main altar, rich in polychrome marble and flanked by two Ionian columns similar to those on the external portal. 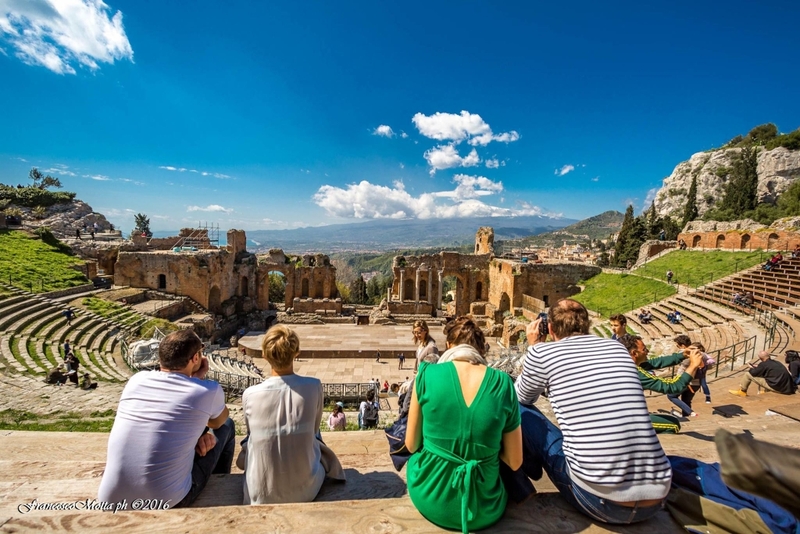 Built in 21st century BC, under Caesar Augustus Octavian, the first Roman emperor, when Taormina was a military colony, the small theater is located just behind the Church of St. Catherine of Alexandria, next to Palazzo Corvaja. Its architecture reproduces almost identically that of the larger theater. 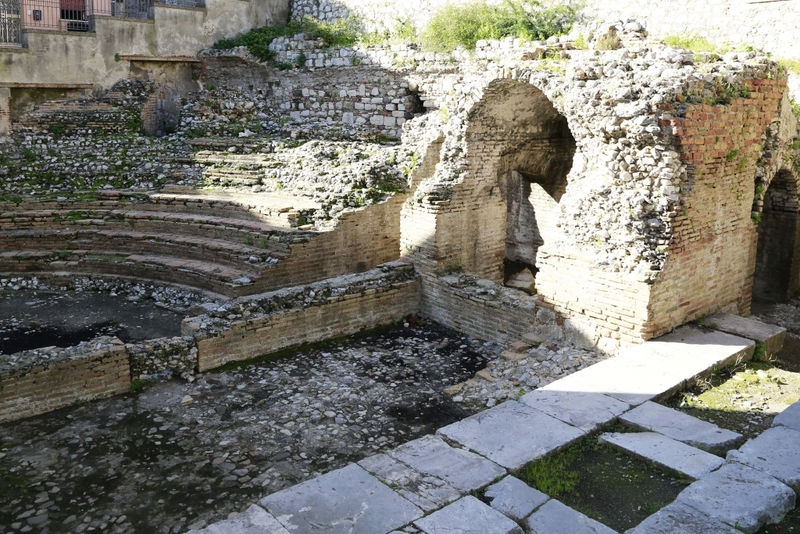 According the construction plan common to all the Roman theaters, it is divided into three main sections: the scene, the orchestra and the auditorium.It is thought that this small Odeon, built right in the center of the Polis , was also used for recitals and auditions reserved for judges, adults citizens, religious persons, the military and their families as well as for special guests. It was built in the first part of 17th century upon the scene of the adjacent Roman Odeon and its architectural style is clearly Baroque. 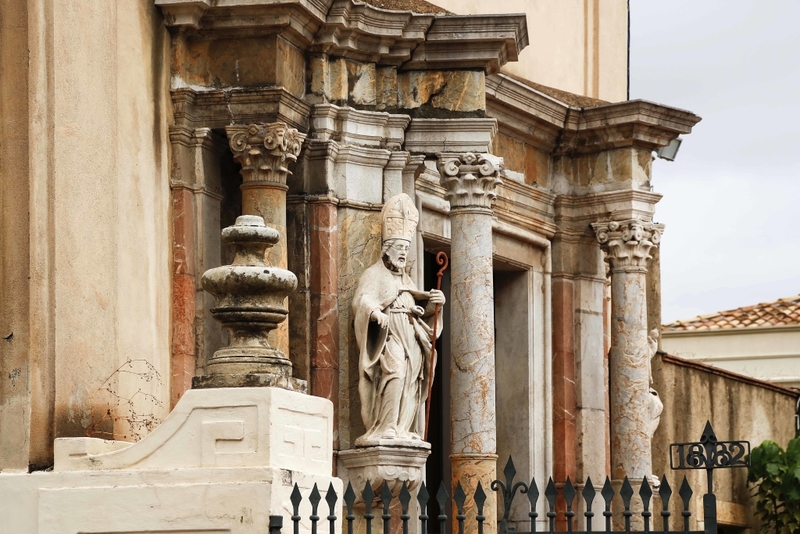 A beautiful portal with jambs and architrave ​​in pink marble from Taormina, opens out in the facade and is flanked on each side by two columns with high bases and Corinthian capitals supporting a broken pediment, in pink marble from Taormina too. Above the portal there is a statue of St. Catherine with two angels at her side, and a little bit higher, an elaborate styled window: two caryatids decorate the top of its jambs, while its lintel reproduces the pediment of a Greek temple. Inside this single nave church, there is a crypt and the remains of cobblestone walls dating back to the greek – Roman period. 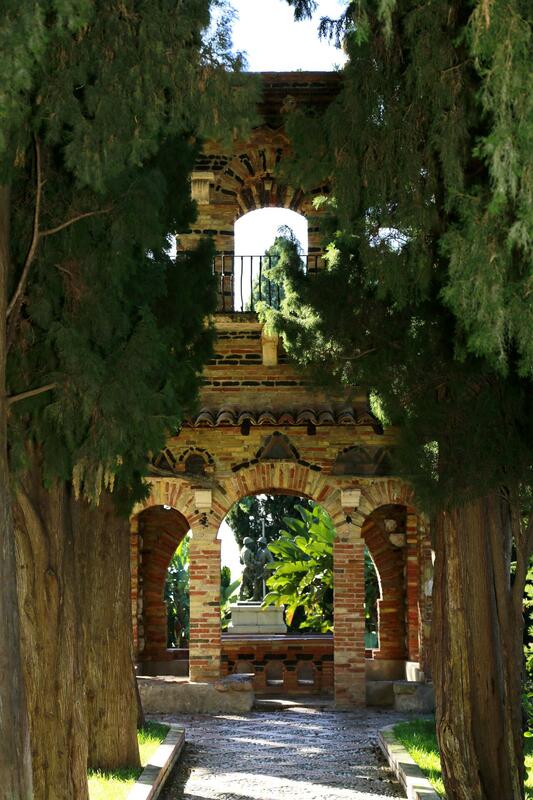 The Public Garden of Taormina, which once belonged to the English noblewoman Lady Florence Trevelyan, was built in the late nineteenth century on the model of the English gardens. The park is built on different levels, connected by wide staircases and stepladders leading to small squares, hidden among the many, fine plants that make this park a small botanical garden.Inside the garden you’ll find the so-called “Victorian Follies”, some fantastic constructions with an evident Eastern influence, where Lady Florence used to go for painting or to welcome her guests. Taking a walk to the “Villa”, as it is called by the people of Taormina, and enjoying the amazing view of the Bay of Naxos and Mount Etna in the background, while seated on a bench, is a real rejuvenation experience. 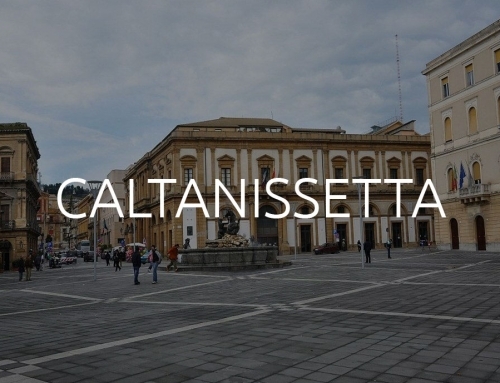 It is located near Porta Catania, the southern entrance of the city, and is definitely one of the Sicilian Gothic masterpieces. It absorbs and blends together elements of Arab and Norman art. This fourteenth-century palace consists of three floors and has a beautiful garden in front of the two main eastern and northen façades. The Palace was the residence of the De Spuches, a noble family of Spanish origin. 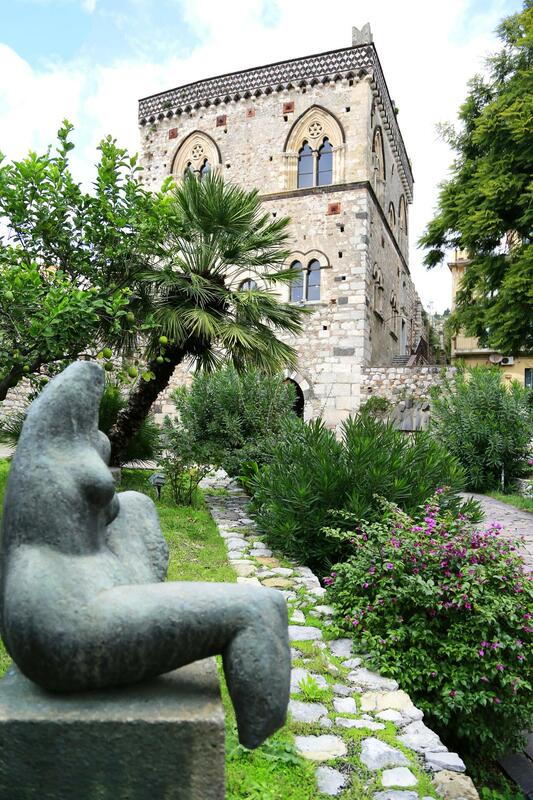 Nowadays Palace Dukes of S. Stefano is the location of Mazzullo Foundation, whose sculptures are on show in the palace. Built between the end of 17th century and the beginning of 18th century, this Baroque style Church dominates the opposite square IX April , known for its amazing views. It lies off the clock tower where the door of the third extant walls opened out. A majestic double flight staircase leads to the parvis, just in front of the monumental portal made of different varieties of Taormina marbles. The church has a single nave with a transept and a dome at its center. Its walls are decorated with stuccos depicting floral motifs and winged heads of angels, according to the symbolism of Baroque art, and various paintings depicting prophets and evangelical episodes. 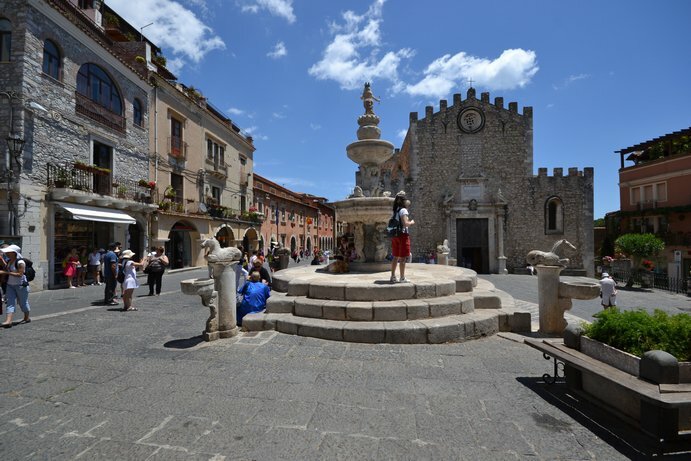 On the right side of the church is the largest onion dome whose bottom part is made of large blocks in Taormina stone.